One of the great things about my (now not so) recent trip to Montréal is the variety of the places that I visited. They all serve excellent coffee, but that’s about all they have in common. Take Résonance, another of the recommendations I got from Marie-Ève of Pikolo Espresso Bar. Down in a basement, it’s in what I’d call an “interesting” part of Avenue du Parc (about 12 blocks up from Pikolo). Café by day, jazz bar by night, it serves a full range of vegan food, one of the few coffee spots in Montréal not to focus exclusively on coffee. Résonance, supplied by Toronto-based Pilot Coffee Roasters, offers as wide a variety of coffee as any place I’d been on my trip. Along with the usual espresso-based drinks, pour-over and cafetiere coffee was also on offer, plus decaf options (essential, I would have thought, for somewhere that says open until midnight!). It was also one of the more spacious coffee spots I’d visited, roughly the same size as Café Olimpico but with a very different atmosphere, which changed as the evening wore on, the focus subtly shifting from coffee to jazz. Résonance is another of the recent crop of coffee spots in Montréal. It opened in October 2012, making it younger (by a whole month) than the Coffee Spot! Set up by co-owners, Colin and Malcolm, both jazz musicians, the coffee focus is provided by Colin, who spent a year as a barista at Pikolo before opening Résonance. I had a long chat with Colin who explained that they wanted to create a focus for the jazz community in Montréal, something they seem to have done very well with live music each evening at nine o’clock. The plan was to do food in the evening, so that Résonance would be a café by day, jazz bar/vegan restaurant in the evening. However, the food was so popular, it’s now served all day. Colin confessed to mixed feelings about this, feeling that it took his time/focus away from the coffee and worrying that the quality might suffer as a result. While I understand his concerns, I think Colin’s talking out of his hat (and a very fine hat it is). First off, if Marie-Ève recommends you, you can’t be doing that badly. Secondly, my extensive testing suggests that the coffee’s pretty damn good. Colin told me that Pilot supplies lots of single origin roasts and, since the flavour changes depending on the batch, it’s a constant process of adjustment to get the best out of each batch. From what I could tell, he’s doing a fine job! 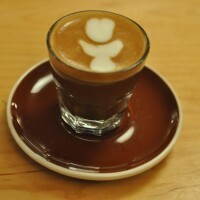 I started with an espresso: well-made, short, strong, not too fruity, but slightly sweet; I really liked it. I then moved onto a decaffeinated cortado. You can have this with normal milk, but Emma, the waitress, recommended that I try it with the house-blend milk. This, in keeping with Résonance’s vegan food, was a blend of almond and coconut milk. The result was a naturally sweet, strong drink which was (much to my surprise) really lovely. The milk has body, while the sweetness blends well with that of the espresso, resulting in a very smooth and full-flavoured drink. It might easily become my drink of choice if I was a regular. I really enjoyed my time in Résonance. I arrived early in the evening when a very young crowd was almost exclusively drinking coffee. However, it was very much change-over time and practically everyone who arrived after me was ordering food or had come for the jazz. Adam joined me at that point and we stayed until the music was over, by which time the average age of the customers had significantly increased! Normally, I’d tell you all about the layout, which I really liked, but I’m out of space and will have to let my pictures (and their captions) do the talking for me. This entry was posted in Bars, Basements, Cafes, Cake, Dinner, Evening Opening, Laptop Friendly, Late Opening, Lunch, Montréal, Restaurants by Brian Williams. Bookmark the permalink.